This warm and wonderfully designed arrangement features sunflowers, orange bicolored roses, orange bicolored snapdragons, liatris and leucadendron, accented by thistle, red hypericum, rust solidaster and preserved oak leaves. 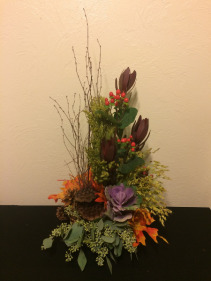 *This arrangement features seasonal items that may not be available at time of purchase. 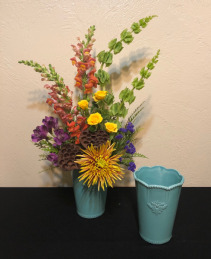 Please call the shop at (208)323-7738 for details about suggested substitutions or to customize a beautifully designed arrangement, just for you! 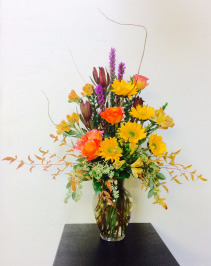 This pumpkin container features sunflowers, orange lilies, burgundy mini carnations and a lotus pod, accented by wheat and greenery. 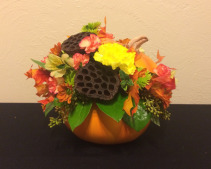 *This arrangement features seasonal items that may not be available at time of purchase. Please call the shop at (208)323-7738 for details about suggested substitutions or to customize a beautifully designed arrangement, just for you! 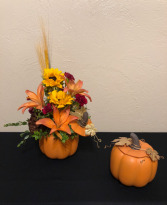 A beautifully crafted centerpiece features, mini pumpkins, autumn asiatic lily, butterscotch daisies, burgundy mini carnations, golden greenery touches and accents of solidaster and preserved oak leaves in a keepsake casserole dish. This reusable ceramic keepsake casserole dish is microwave and dishwasher safe (though, handwashing is recommended). *This arrangement features seasonal items that may not be available at time of purchase. 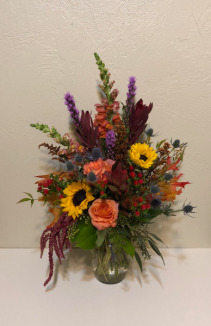 Please call the shop at (208)323-7738 for details about suggested substitutions or to customize a beautifully designed arrangement, just for you!